The Avantone Active MixCube Powered Full-Range Mini Reference Monitor is a professional studio reference monitor specifically tailored to produce the useful musical range of 90 Hz to 17 kHz. In today's world of high definition media, it is still necessary to mix music that translates and sounds as defined on Lo-fi speakers such as laptops and Smartphones, as well as Hi-fi full-range HD audio systems. The Active MixCube provides audio engineers with accurate and detailed mid-frequency referencing, leaving the larger 2-way and 3-way monitoring systems to bass and high-frequency referencing. 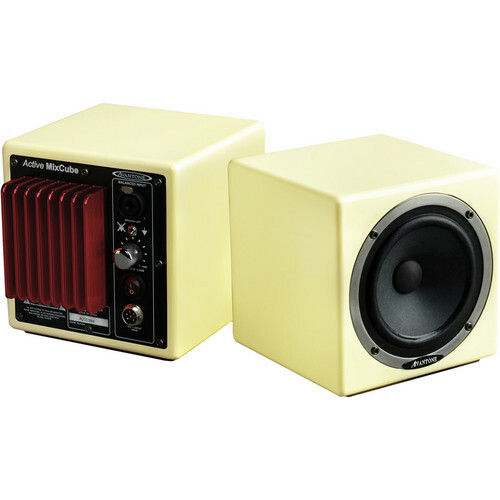 The Active MixCube features a powerful and accurate 60W (RMS) amplifier and 5.25" driver enclosed in a handsome MDF cabinet with a retro-cream finish. The input connector is an XLR-combo connection with XLR and 1/4" TRS phone inputs that accept balanced and unbalanced signals. There is a variable gain control dial and on/off switch. The speaker features an external power supply with a 10 foot (3 meter) AC cable attached to the power supply, and an additional 10 foot (3 meter) cloth multi-pin cable that connects the power supply to the speaker. The Active MixCube's small size makes it easy to place in any studio setting, and as an added feature, Avantone installed a 5/8"-27 thread microphone stand fitting to the base of the speaker. Box Dimensions (LxWxH) 12.8 x 10.2 x 8.4"